Ekal Vidyalaya Foundation of USA has been selected as the Charity of Choice at the 27th Annual Mardi Gras on March 5, 2011. The event, which was hosted by the George Mitchell family, took place at The Tremont House in Galveston. The annual fundraising gala originated in 1985 with the grand opening of The Tremont House and the revival of Galveston Island's city-wide Mardi Gras celebrations. Each year a different country is chosen as the theme, and this year's event was to celebrate India, and was titled "The Enchantment of India". The gala gave each an opportunity to help the Ekal Vidyalaya Foundation at the same time paying tribute to a 5,000 year-old civilization with ancient cultures and rich heritage. Each year an educational charity of the country that is chosen by the George Mitchell family that benefits from the proceeds of the gala. This year Ekal Vidyalaya was chosen as the charity of choice, the proceeds of over $10,000 will be presented to Ekal on behalf of the George Mitchell Family and Naveen and Shubhra Ramineni. RICE club organized a programme on March 12, 2011 for collecting funds for Ekal. The event was titled ‘Vibrant India’ and was held at the United Methodist Church in Hunters Creek. Several Lake Highland students participated including Jassie Kalsi, Shreya Bansal, Shilpa Reddy, Preethi Raghavan, and Natasha Patel. We were able to raise $365, enough to start one school for Ekal. The ongoing and urgent requirement for blood is a well accepted universal phenomenon. Blood requirement transcends boundaries, race, caste, creed, gender and religion. Please consider these chilling ground realities. A. India requires 4 crore units of blood every year. Only a meagre 40 lakh units are available through voluntary donations. B. Every two seconds, somebody in India needs blood. C. One out of 10 hospital patients needs BLOOD TRANSFUSION. D. In order to match India's generous requirement for blood, more than 38000 Blood Donation Camps are needed to be held everyday. In the backdrop of the above mentioned chilling statistics, the GUSTO and EVER EMPOWERING ladies of Friends of Tribal Society, Ladies Wing, Indiranagar Bangalore, organised a MEGA Blood Donation Camp on 26th February, 2011, at Rotary TTK Blood Bank, New Thippasandra, Bangalore. This camp was meticulously and professionally executed. The main architects of this camp, were Ms. Sabita Aggarwal, Ms. Sita Goyal, Ms. Prem Chooriwala, Ms. Praveena Lohia, Ms. Manju Aggarwal, Ms. Kusum Dhokaniya, Ms. Seema Aggarwal and Ms. Lata Amashi. There was joy, excitement and enthusiasm in the air. The ladies were able to rope in 59 units of blood. They admirably excelled their previous record. The first camp was conducted, on March 11th 2010 where 50 units were collected. Success begets success. The ladies are planning a future camp wherein, they have promised to collect over 200 units of blood. This would equal the collection in an Engineering College. Sir Winston Churchill once aptly remarked, “We make a living, by what we get, but we make a life by what we give". The ladies of FTS Indiranagar amply epitomised the sentiment of Sir Winston Churchill, by giving “something of themselves", to propel this very noble initiative, into a grand success. The fifth and final of the Samanvay Vargs concluded in Guwahati on 15th March 2011. Earlier Samanvay Vargs had been held in Ranchi on 17th, 18th and 19th December 2010, in Jaipur on 25th, 26th and 27th December 2010, in Surat on 7th, 8th and 9th January 2011 and in Bangalore on 28th, 29th and 30th January 2011. In these meets the samity members of the chapter in cities, the Anchals, the Sankuls were able to discuss the issues related to Ekal's working in villages. Senior full time volunteers who overlook the implementation of programmes were also present to give first hand information. The Varg's emphasis was on establishing contact with the Samity members in the Chapter, Anchal, Sankul, Sanch, Village with the actual operations in Ekal Vidyalayas. 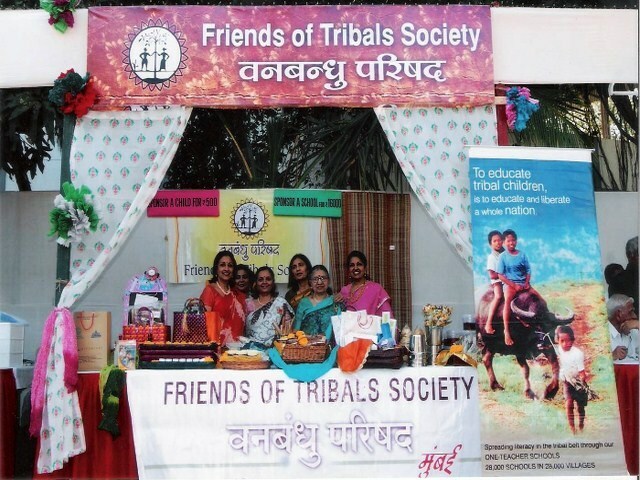 FTS Mahila Samiti run a stall of Friends of Tribals Society in Anand Mela at CCI Mumbai on 12th & 13th February 2011. 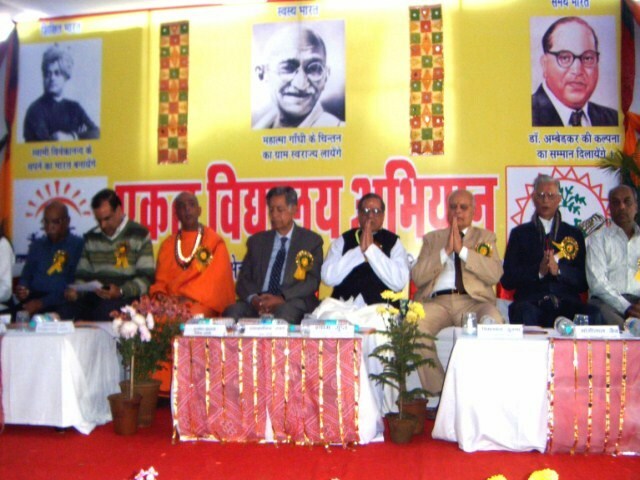 Anand Mela was organized by Rajasthani Mahila Mandal. Mahila samiti arranged FTS stall to create the awareness about Ekal Movement. Majority of our members participated enthusiastically in this important event. 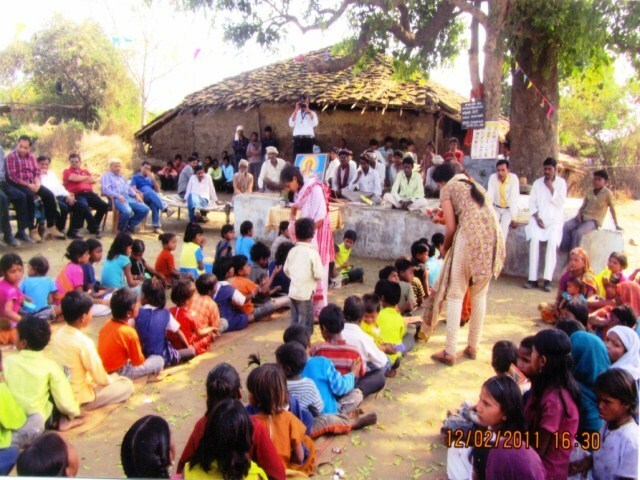 Friends of Tribals Society, Bhopal organized a Vanyatra on 13th Feb., 2011 in Kaloni (Gundrai) and Kodhri village of Raisen Anchal, Madhya Pradesh. All the visitors gathered in a Hotel of Bhopal. A total of 36 members participated. Sri Suresh Kumar Chauksey, President FTS, Bhopal and Sri Kishore Kumar Gupta, Secretary, FTS Bhopal welcomed all the visitors. After having lunch all departed to Raisen at 9.00 AM. Vanyatris reached Raisen at 10.00 AM where the members of Anchal Samiti welcomed all the visitors. Vanyatri reached Kaloni (Gundrai) village from Raisen via forest. Village Samiti welcomed all in traditional way by putting on Tilak and garlands. After it, the visitors and the villagers reached the Ekal School where The Acharya was teaching the students. After conducting the School, Smt. Uma Sodhani, President, Mahila Samiti and Dr. Unnati Pitle asked the questions from students, the answers were satisfactory. Teaching material, Sweets and toffees were distributed to the students. After visiting the Kaloni (Gundrai) village, the visitors reached Kodhri village. The Village Samiti welcomed all in traditional way. Then all reached the Ekal School with blowing drums and singing the Song. The teacher conducted the school there. The students performed alphabetic knowledge, mathematics, national anthem, stories and Surya Namaskar etc. The visitors distributed teaching material, sweets and toffees to the students. Sri Suresh Chouksey ji and Sri Ajay Kumar Chhajed discussed with village smiti. 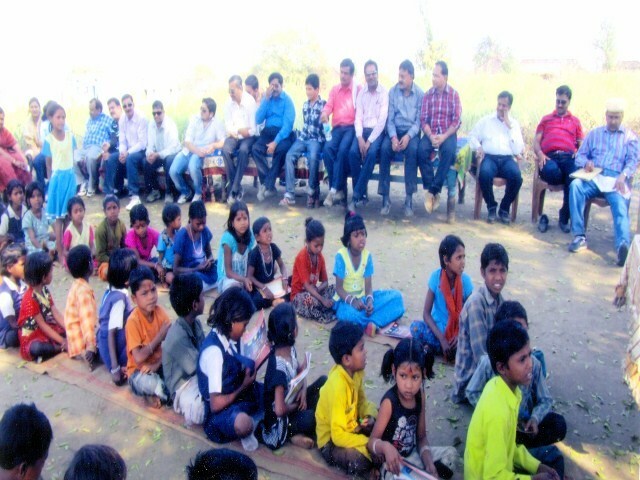 They insisted to continue conduction of the Ekal School in the village. The visitors honoured the Achary Sri Ramswaroop, his parents and village Pramukh. The villagers organized lunch (Dal Bati) for the visitors which was wonderful. After taking lunch, the visitors departed for Raisen where they organized a programme of tea and sharing their experience of Ekal School visit. Everyone shared his experience and praised the wonderful work of Ekal. On the 31st January 2011 Smt Sashi Srivastava of USA, accompanied by Sri Naresh Grover, President of the Jabalpur chapter of FTS, local residents, members of the SVO and Ekal field volunteers went on a ‘vanyatra’ to villages Lalpur and Kakartala in the district of Lakhnadon near Jabalpur in MP. Smt Srivastava has given several suggestions for improving the life of the villagers and how Ekal can contribute to achieve this goal. Sri Om Prakash Aggarwal and some of his team mates from the Siliguri chapter of FTS went on a ‘vanyatra’ to three villages in Naxalbari area near Siliguri in West Bengal on the 10th March 2011. Sri Vijay Maroo, President EVFI, two British citizens Sri Cedric C. Lodge, a Railway engineer, and his wife, Sri Rajen Bali, an internationally renowned travel writer, Sri Rajendra Baid, editor of the local daily Janpath Samachar and few others were also in the team to visit the Ekal schools in these villages.